The Ravenblack Necropolis Vampire Roleplay • View topic - How'd you like a Solid Gold Squid? Gorgeously gorge-worthy gigantic golden gorgeousness given generously by Lyssa / Vex. God, it's Gorgeous. For more information, click the image above. Then, watch this space for the Nomination Form link, and best of luck! *KRKN does not guarantee that everyone will get ahold of a solid-gold Squiddy. And certainly not the real Squiddy. He is a precious jewel, yes, but he's not to be grabbed. Re: How'd you like a Solid Gold Squid? You have 2 weeks! Nominations will close December 29th and voting will begin! You may notice that many categories this year include a reason. Please remember to add your reason why you voted the way you did. We may read some of these at the reveal party! If you need any help with filling out the form, check out this audio guide! All votes will remain anonymous but you do need to add your name to the nomination form so to validate it. 1 vote per person (Character) and all rules are listed on the form. Have fun with this and remember to look citywide. Lets make this the best awards ever! Thank you to those who have already nominated! For those who have not, you have 1 week left! Nominations will close December 29th and voting will begin! All votes will remain anonymous but you do need to add your name to the nomination form so to validate it. 1 vote per person (Character) and all rules are listed on the form. 2 more days! If you want to nominate someone, now is the time before it is too late! 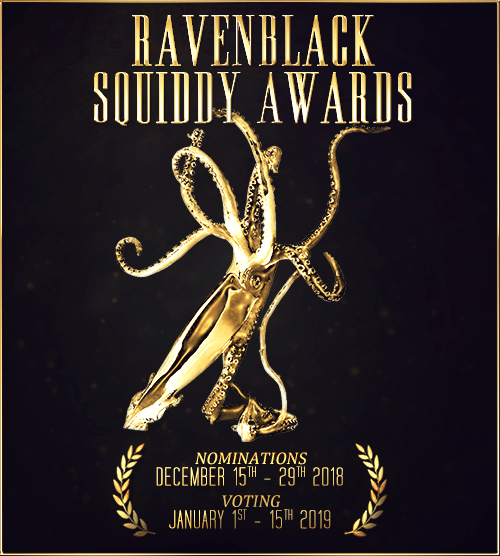 This is your shiny, friendly reminder that the Squiddy Awards Ceremony and After-Party are this Saturday, January 19 at 6pm Pacific Time (9PM Eastern)! Join myself and Lannair for a giant pile of shenanigans, fun and radio bullshittery, oh and a few golden squids too. If you've lost the address or never visted KRKN before, y'can join us here!